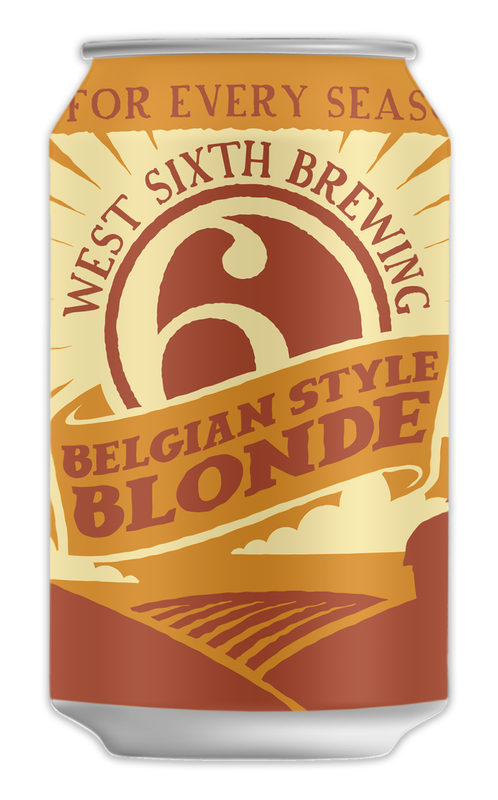 West Sixth Brewing announced today the start of a new series of seasonal canned beers that will be released in limited quantities throughout 2015. The first beer in the series will be the Belgian Blonde. This beer will be available around March 1st for 3 months, or until supplies run out. 2 other seasonals are planned for later in the year. This beer, known in the taproom as the Bryan Ave Belgian Blonde, is light in color, but deep in flavor and aroma with hints of spiciness that come from the Belgian-style yeast that is used when brewing the beer. It finishes moderately dry with just enough hop bitterness to balance out any remaining sweetness. “We’ve got several hop-forward beers in our lineup, as well as several that are malt-forward, so it will be fun to have a beer that really focuses on the yeast – which is sometimes the most under appreciated ingredient in any beer”, said head brewer Robin Sither. The label, which is different from many of the other West Sixth offerings, features an orange and yellow Kentucky farm scene. “Since this Seasonal release is West Sixth’s take on the classic Belgian Blonde style – our can design is meant to reflect the warm tones of Spring with rolling hills and the promise of good stuff growing up from that rich Kentucky soil.” said designer Brian Turner, of Cricket Press, who designed the new can. The beer will be available throughout West Sixth’s distribution area in kegs and cans beginning in March.